Just released on DVD and Blu Ray from Anchor Bay is a movie I have been looking forward to for a long time. The Divide is a post-apocalyptic nightmare with a great cast. The fact it was directed by Xavier Gens, best known for his French horror classic Frontier(s), was just one more reason I had to see it. The Divide begins right as a nuclear bomb is decimating our country. A group of survivors who made their way into a bomb shelter have to rely on Mickey (Michael Biehn), who built the shelter, to keep them safe. Soon the inhabitants, which include a somewhat estranged couple (Lauren German and Ivan Gonzalez), a mother (Rosanna Arquette) and her young daughter (Abbey Thickson) as well as a few others begin to divide into groups and form alliances. When two of the inhabitants (Milo Ventimiglia and Michael Eklund) tie Mickey to a chair and take over the group, the others strive to stay sane...and alive. The Divide is a surprisingly bleak and brutal film. The cast is very fine, especially the evil Ventimiglia and Eklund, who were two of the scariest characters I have seen in a movie in a long time. Props also must be given to Biehn, one of my favorite actors (who I was fortunate enough to meet - see a pic HERE) and Lauren German who I loved in Hostel 2. Rosanna Arquette also does a great job as the desperate mom who becomes the target for the evil sadists' debauchery. The film, which clocks in at 2 hours, didn't have a single dull moment. I followed along closely as the story unfolded and the characters started to change (or become their true selves) during the solitary confinement they were trapped in. Anchor Bay's disc I viewed was an unrated version and this was definitely not kids stuff. 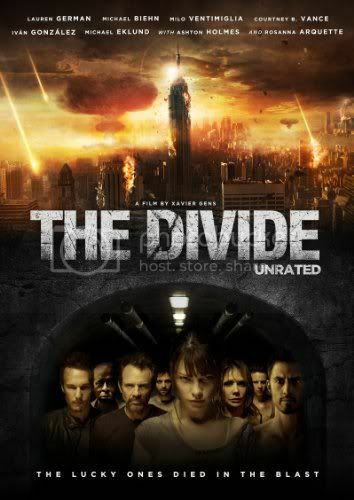 A very dark, scary and sometimes stomach churning film, The Divide is destined to be a classic post-apocalyptic film that fans of the genre should definitely check out...before the world ends!